Deeply saturated, nearly black matte lips may have ruled the runways for Spring 2010, but that look can be extreme for the everyday woman. After spotting the trend on the runways, and in light of the current vampire trend, we at Three Custom Color Specialists were quick to rise to the challenge of translating the black lip look from the runway and silver screen to real life. The result is Noir, a seductive almost-black shade with hints of burgundy and plum, available now in both our award-winning sheer lipstick formula and makeup artists' favorite non-sticky lip gloss. Noir is sheer and flattering on all skin tones; from Fair to Deep, from Cool to Warm. Stain pigments built into the color work with the natural pigment in your lips, making it unique to each user. One swipe imparts a very deep sheer burgundy; layer it for a more daring, edgy look. 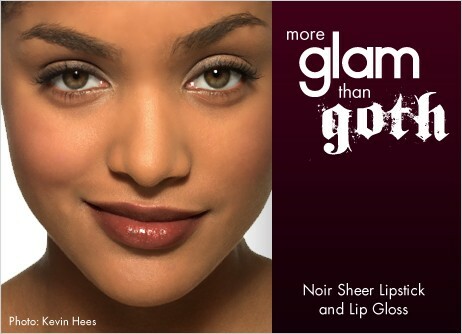 A seductive shade with hints of burgundy and plum, available in our makeup artist’s favorite non-sticky lip gloss. A seductive shade with hints of burgundy and plum, available in our award-winning sheer lipstick formula.